Backflow Testing & Certification Services: we can fix it! Have you been notified by the city or county that the backflow prevention assembly at your property is due to be tested and certified per State and local regulations? Is your backflow device up to code? Backflow assemblies are extremely important in protecting our water resources and must be inspected annually to ensure they are working properly. 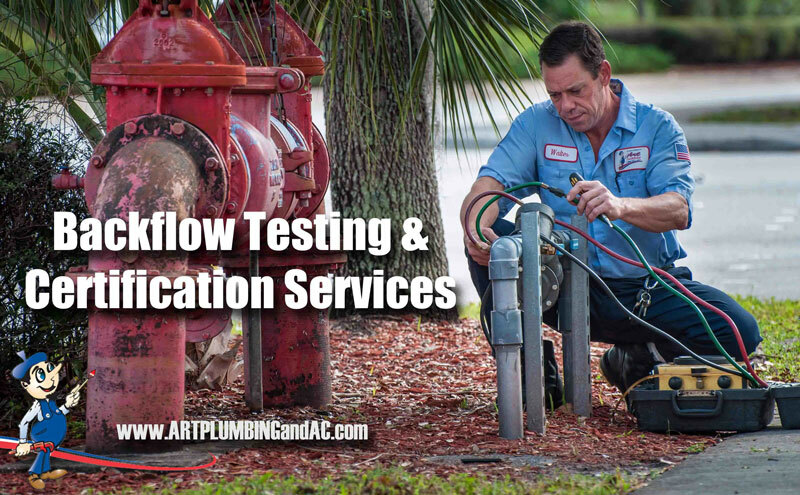 Art Plumbing, AC & Electric has a team of plumbers that are licensed, trained, and experienced to provide you with services that are precise and thorough. Call us today and schedule your Annual Backflow Test. We pride ourselves in the high-quality professional service we provide at a reasonable cost. Call Art today at 1-800-475-1504. For Any Of Art Plumbing, AC & Electric's Services!